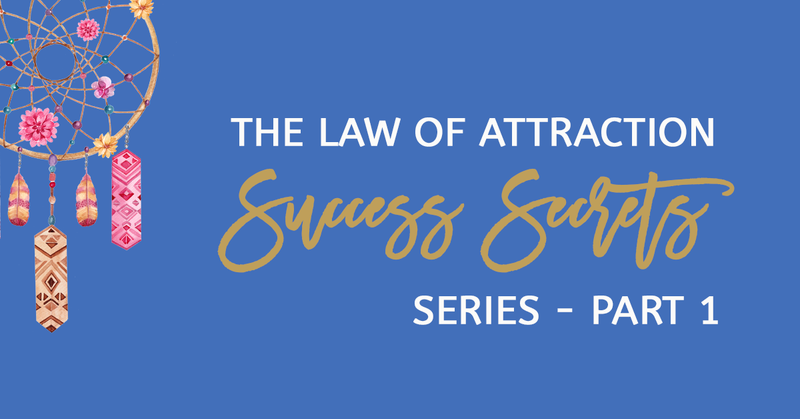 This is Part 1 of the Law of Attraction Success Secrets Series. Over the next few weeks, learn the tips, strategies and techniques that my mentor Sandy Forster, Millionaire Mindset coach used to get from Welfare to Millionaire! This is a very detailed program into how you can live, breathe and take advantage of the one of the Laws of the Universe – the Law of Attraction to attract everything that you want in your life. Whether this is money, love, health and happiness… use these techniques and watch your amazing and beautiful life unfold before your very eyes. Just remember though, that all success, abundance and prosperity, like anything starts with the mindset. So each step that we take to change our mindset, will speed up our goals in the long run! So the first thing that I ask from you is to put aside all your disbeliefs, doubts and fears about the Law of Attraction and make that commitment to yourself to be open minded and do these techniques on a regular basis. And to keep track of your progress, I want you to go get yourself a beautiful journal that you can refer time and time again. Jot down, where you are now and the little amazing miracles that will take place, once you foster these tips and techniques. Ok, so we got that? So some of you may or may not know this, but I am not only a business coach, but I am also a certified Law of Attraction coach and Law of Attraction Success Secrets facilitator. Trained and mentored by the one and only Sandy Forster. For those of you who don’t know Sandy, she is such an inspiring thought leader and Millionaire Mindset Mentor. She is also a member of the Transformational Leadership Council, composed of trainers, leaders, authors, movie producers and coaches, who are the leaders of personal transformation. Sandy is well known for her journey from Welfare to Millionaire, using the Law of Attraction techniques. She’s an international bestseller and founder of Wildly Wealthy Women, the Inspired Spirit Coaching academy. She lives and breathes the Law of Attraction and I’ve had the amazing privilege to have learnt all the Law of Attraction techniques from her. She has transformed the lives of thousands of women and have helped them achieve prosperity and wealth using the exact same principles that she used to attract abundance in her life. So what I’m going to teach you over the next few weeks, is a program, divided into various podcasts, to kickstart your journey into using the Law of Attraction techniques into your life. I know that when you follow this process, you will change your life too. It has certainly done so for me. Since I started using the Law of Attraction in my life, I attracted the man of my dreams, my family, my business and all the amazing people and mind-blowing opportunities. Every time, my husband and I have a dream, we get it on our vision board … and watch it materialise before our eyes. I am a true believer of the Law of Attraction, only because I’ve seen it work time and time again. And I want you to experience it too! So are you ready to do this? Can I get a hell yeah? Hell Yeah! I can hear you all from here! You want to be prosperous in all ways possible – family, love, money, business success… whatever prosperity means to you. Allows you to have everything! Maybe you have heard about the Law of Attraction before, read the book or watched the secret, but still feel like there is something missing. One thing that is really crucial for you to understand .. it’s this. Your thoughts and your feelings create your world. You’ve probably heard this all before, but it’s imperative you embody this and really believe it. Think of yourself like a radio transmitter. The signal you give OUT is what you then see, hear and experience. So being mindful of how you think and feel is extremely important. Your feelings determine whether you are attracting or repelling what you desire for yourself. So for example, if you have a business and you want to make more money… but you’re feelings around money is “I’m not worthy enough to make money….” Or “Money is evil. Rich people are evil.” Then guess what you think will happen? That’s right ladies…. The money won’t flow into your life and you’ll always be struggling around money. I know this, because I’ve been there before. But this type of mindset doesn’t serve us! So if you find that you have some negative money blocks too, it’s time to start working on shifting these money blocks and start allowing the flow of abundance to come to you. So today and over the coming weeks, you will learn tips, strategies and ideas for YOU to implement immediately. But before we do so remember, you are responsible for your life. I’ll give you some techniques, but what you do with it, determines whether you change your life, or not. How you focus or work on these techniques will determine whether you attract or repel what you want. So just give it go! What do you have to lose huh? Listen in on the Podcast to learn all about the foundation, to prepare you for the program over the next few weeks. Ok, so Wild Woman, I hope this all makes sense to you. It’s time to dive into the techniques and strategies to help shift the way you think, the way you look at your life and the way you create abundance. It doesn’t have to be a long, hard trek up the hills. Once you really get this, you will attract so many crazy, miraculous things in to your life, you will have to pinch yourself to prove that you’re not dreaming. Believe me, I know! I’m doing it right now. So get onto this fundamental activity and I’ll see you next week for some more Law of Attraction fun! If you want to know more about Sandy Forster, visit www.wildlywealthywomen.com. And if you liked this episode, subscribe to the Wild Woman Run Free podcast on iTunes or Stitcher and let us know what you think, but writing a review or recommending this to your girlfriends! Or if you want to join the Wild Woman tribe, subscribe above! I look forward to hearing all about your success over the coming months. Stay tuned for next week’s Law of Attraction Deep Dive episode and until then Wild Woman, live wild, live free, wild woman run free baby! Perfect timing for a perfect podcast.